NEW ORLEANS – Oh, you thought you could take a break? There’s no time for breaks as the conclusion of the NCAA indoor meet means it’s time for outdoor action, which the U.S Track & Field and Cross Country Coaches Association (USTFCCCA) is gearing up for with its release of the preseason edition of the NCAA Division I Women’s Outdoor Track & Field National Rating Index on Monday. Teams will battle all season long, which ends with the 2019 NCAA DI Outdoor Track & Field Championships, hosted by the University of Texas in Austin, June 5-8. It should come to no surprise that Southern California, the defending national champions, lead off the outdoor season as the No. 1 team in the country. The Women of Troy return a talented roster from last season which includes five athletes ranked in the top-five of their respective events of the TFRI Individual Rankings: Anna Cockrell (tops in the nation in the 400H), Terry Twanisha (best in the 100), Lauren Rain Williams (fifth in the 200), Dior Hall (fifth in the 100H) and Kaelin Roberts (fifth in the 400). Sophomore Chanel Brissett looks to be a top contributor as well. It is the first time the program has started the season in the top spot in school history. Debuting outdoors at No. 2 was Texas A&M which is the best ranking received by the program to start a season since 2015. The group should see top contributions come from Tyra Gittens (tops in the heptathlon), Jazmine Fray (second overall in the 800), Serena Brown (second in the dicus) and Madalaine Stulce (fifth in the javelin), among others. Holding down the No. 3 spot was LSU after a sixth-place finish at outdoor nationals a year ago, the same place the team finished at the recently held national indoor meet a week ago. LSU will look to get top contributions out of Kortnei Johnson (second individually in the index in the 100 and third in the 200), Lisa Gunnarsson (second overall in the pole vault) and Tonea Marshall (third in the 100 hurdles). The groups 4×100 unit also ran this past weekend to kick off their indoor season in which they posted the second-best time run so far in the country. Slotting in at No. 4 is Arkansas. The Razorbacks have a heavy-hitting roster that is fresh off a team title at the 2019 NCAA Division I Indoor Track & Field Championships two weeks ago. Arkansas will look to be led by The Bowerman Watch List member Lexi Jacobus (ranked No. 1 in the country in the pole vault), Payton Chadwick (second in the heptathlon), Janeek Brown (third in the 100H), Tori Hoggard (third in the pole vault), Kelsey Herman (fifth in the heptathlon) and Jada Baylark (fifth in the 100). Coming in at No. 5 is Oregon, which is two spots better than its sixth-place finish at last year’s outdoor meet. The Ducks also took seventh at the indoor meet not too long ago. Oregon will look towards leaders in Makenzie Dunmore (second in the nation in both the 200 and 400), Jessica Hull (second in the 1500) and Chaquinn Cook (third in the triple jump). Rounding out the top-5 at No. 5 is Florida State. The top-ranked Seminole athlete is Rougu Sow, who is billed No. 1 in the TFRI Individual Rankings in the long jump. Completing the rest of the top-10 was Florida State, Kentucky, Miami (Fla.), Colorado and Florida, in that order. The SEC led all conference with eight programs being ranked in the top-25. They were followed by the Pac-12 with six, the ACC with 4, the Big 12 with 3, the Mountain West with two and the American and Big 10 with one apiece. 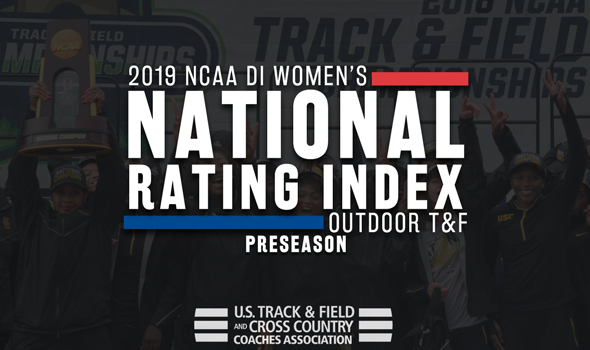 The next National Track & Field Rating Index will be released on Monday, April 1.